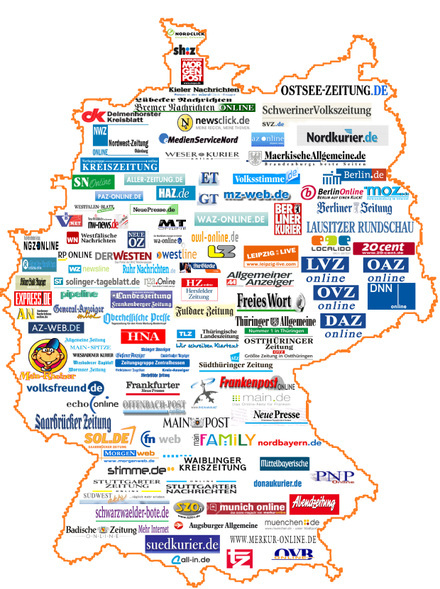 Today, Brightcove has announced a wide-ranging partnership with OMS, Germany's online sales and marketing network for regional newspapers, which will enable OMS to use the Brightcove platform to develop an online video network for its member newspapers. The new network will feature premium content licensed and distributed by OMS, as well as local video published by the regional newspapers through Brightcove. OMS will sell advertising against the combined video inventory and provide a new ongoing revenue stream to participating newspapers. The online video network will launch later this year with seven regional newspapers and expand to include over 60 newspapers through the OMS initiative. The map below highlights the OMS member publications. Commenting on the news, Kim Kriegers of OMS, said: "The deal announced today with Brightcove has given OMS the ability to rapidly launch an expansive video distribution network across multiple websites and manage a complex set of advertising programs." Kim's colleague, Managing Director, George Hesse added: "At the same time, OMS is giving member newspapers access to the most comprehensive and scalable platform in the world which they will be able to use to add premium video content to their websites from the network and publish regional news coverage produced by their local newsrooms. Our objectives are to collectively capitalize on the revenue growth in the online advertising categories of videos." OMS joins a growing list of Brightcove customers in Germany, which also includes one of largest magazine publishers in Europe, Gruner +Jahr, which we announced earlier this year.